You can now send sequences from a teammate’s account. When the candidate replies, the reply will go straight to your teammate’s email where they can then continue the conversation. The good news is you can still monitor the state of that sequence, track replies opens & clicks in your Sequences page in Gem and your reach outs show up in your Outreach Stats page. 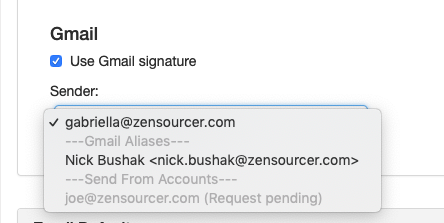 Use this feature if you want your teammate to receive replies and to be in charge of correspondence after the sequence is sent. If you prefer to be in control of the correspondence yourself, the Gmail Alias feature might be a better fit for you. Please reach out if you need help deciding which use-case works best for you! You can configure your Send From accounts either in your Gem settings. Navigate to Sender Settings>Send-From Accounts. From there, Press Add Account and type in the email address for the person that you'd like to send as and press Send Request. Your teammate will then receive an email with a link in Gem where they can grant you access. Once they grant access, you will receive an email that they accepted your request. Now you will be able to choose their email from the Sender dropdown and send emails directly from their email address. 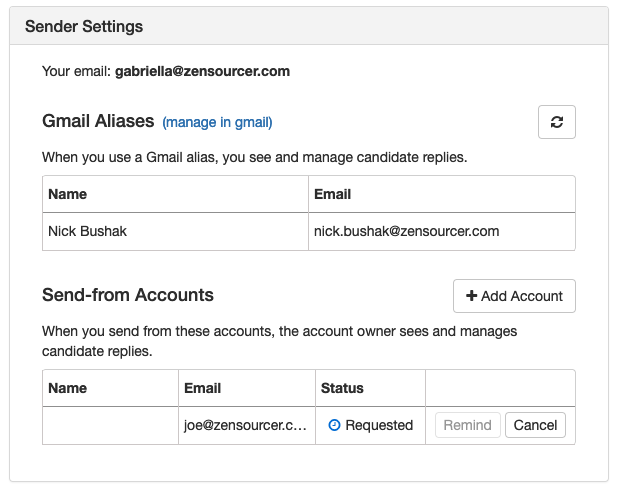 When the candidate replies, the response will go directly to your teammate's inbox. Need help sending sequences from a teammate's account in Gem? Feel free to reach out to the Gem team by emailing us directly at support@gem.com or press "Chat with Us" in the Gem home page.